The mountain chalet combines a traditional as well as modern style in a very charming way by using high quality materials of the region. 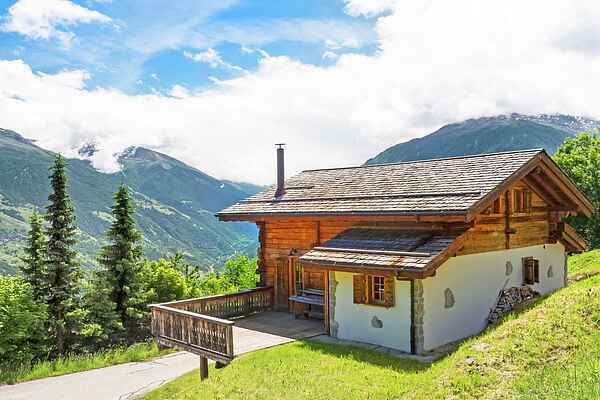 The large open-plan living/dining area with balcony and two terraces attached offers amazing views over the Matterhorn and Dent Blanche mountains and the valley. Well-equipped kitchen. Five bedrooms; master bedroom with bathroom ensuite. Two private parking spaces available directly at the chalet. Distance to the alpine ski slope Les Collons - Les Masses, part of the ski area of 4 Valleys - Verbier: ~700 m (no parking possible), ski bus stop ~300 m. The resort center of Les Masses features a small supermarket and a restaurant; more shops, restaurants, bank, post office, ski rental and ski school in Les Collons, ~2 km. Indoor swimming pool and kindergarten (from 18 month on) in Thyon 2000, ~6 km. Cleaningcost are per person per week. In the winter season (state of 2018-2019) clients get up to 30% OFF on public ski pass tariffs -New years week excluded- for the entire ski area Les Masses - Les Collons - 4 Vallées, for 6 days pass, when presenting the discount voucher at the lift cashier before purchasing the ski passes. Therefore, please ask the local agency to give you the discount voucher at arrival. Claiming the discount after purchase is not possible.